Almost daily, I run into the misconception that the function of sales and business development are interchangeable, from co-workers to industry peers. This stems primarily, I believe, from the shift in titles of salespeople to business development -- which has been done in an effort to avoid the negative connotation that surrounds it. In reality, the two are very different. Hence, this tweet. If you use the terms Business Development and Sales interchangeably, you're doing it wrong. But 140 characters just isn't enough to explain of the subtleties, so here we are. When you think about the function of business development, it should be thought of as a marketing function. Yes, there are some soft sales skills (qualification, negotiation, etc.) that are necessary to become a good business development professional, but at the end of the day, it's a marketing function. If you were to think about it on a sliding scale between a pure function of sales or marketing, it would wind up somewhere around here. The reason behind this, is that typical goals of business development include brand placement, market expansion, new user acquisition, and awareness -- all of which are shared goals of marketing. The slight slide towards sales is simply because of the tactics business development employs to achieve those goals. Which is where we get into the meat of it. Regardless of the company, business development tends to hold the same structure, which I sketched up quickly below. Simply stated, the function of sales is to sell directly to the end customer. 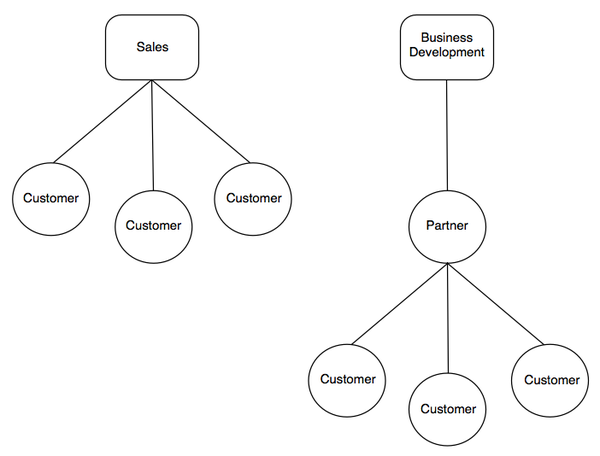 The function of business development is to work through partners to sell to the end customer, in a scalable way. Scalability is the differentiator. It allows a company to use pre-existing sales teams or communities that a partner has developed to reach new audiences. Sales is very much an equation of capacity, which is why sales teams tend to grow so large. Business development teams, on the other hand, are typically very small, maintaining their small size by working through existing partner infrastructures. The art of business development comes in identifying partners that fit that description, while finding a way to provide value to the partner's end customer and business. You can see this relationship in a few of the examples I laid out in a previous post on the role of business development at a startup. Now, all of this isn't meant to de-value the function of sales. Truth be told, I really respect good salespeople. It's an extremely difficult career, one with constant denial and pressure to succeed. Sales is hard, and should be respected when it's done at a high level. But the two are very different, despite their apparent overlap.